This house, the product of 10 years research, probably represents one of the most interesting developments currently achieved in the field of domestic architecture. Protection against harsh weather due to changes in the climate, seismic risks, thanks to its self-stabilising principle, and forest fires. Its simplicity due to the use of the ancestral technique of underground vaults. use as few different building materials as possible. The house must protect people from bad weather resulting from changes in the climate (heavy rain and winds over 150 km per hour), forest fires and seismic risks, thanks to its self-stabilising principle. Based on a natural principle, the Bioclimatic house controls its own temperature. Facing south, south-east or south-west and with its western, north-eastern and eastern sides underground, it has maximal thermal insulation. The southern side is made entirely of glass. Indoors, a concrete or water storage heater provides the inertia necessary for this type of house by accumulating heat during the day and releasing it at night. The overhang above the glazing stops the sun coming in during the summer, thereby reducing the rise in temperature. 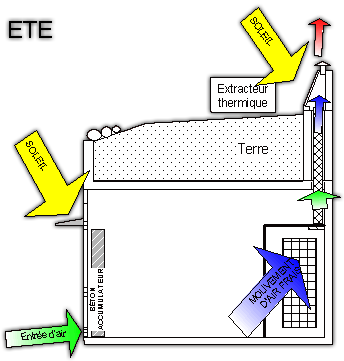 The circulation of air, and consequently of heat, drawn by the thermal extractor, is ensured from bottom to top without any mechanical assistance. Direct sunlight heats the floor and the walls, as well as the concrete storage heater, which releases its heat 5 hours later. A 70cm overhang (which in our latitude is situated a quarter of the way down the glazing) stops the sun's rays from coming in at the hottest time of the day. 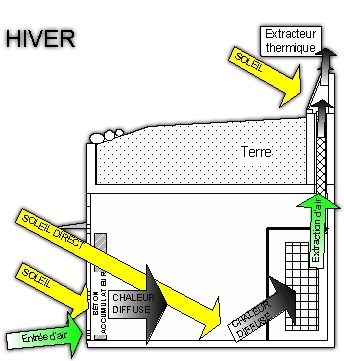 The "cellar" principle keeps the indoor temperature at no more than 20°C. To avoid condensation, the thermal extractor keeps the air circulating, with maximum extraction during the hours of sunshine. 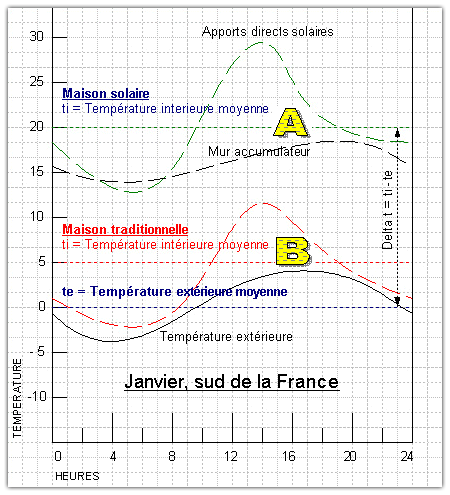 It can be observed that in spite of almost identical insulation in both the bioclimatic house and the traditional dwelling (see losses in tables 1 and 2), the latter, having no glass walls and therefore no supply of sunlight (table 4), cannot (without heating) exceed an average of 5°C in 24 hours (curve B on graph). 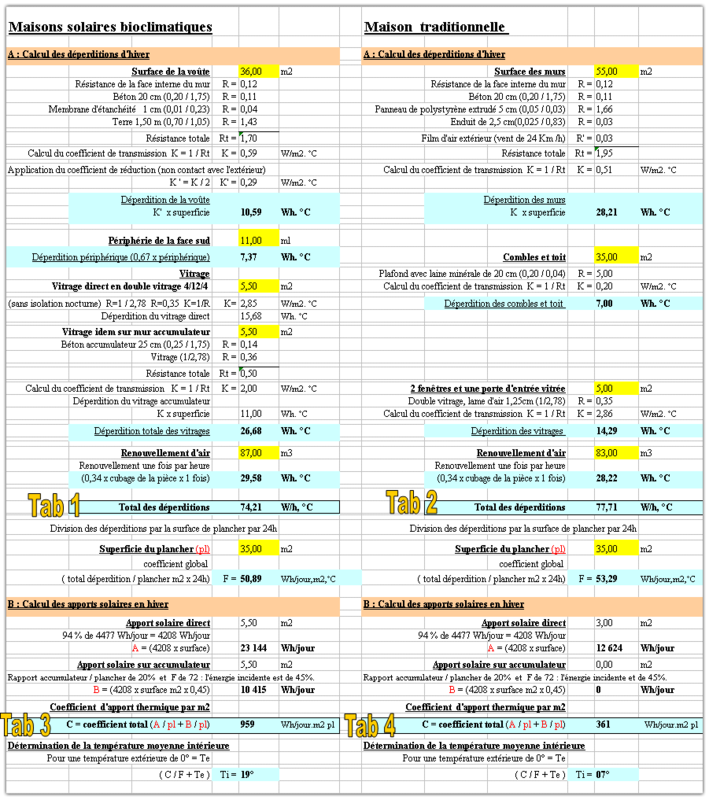 The bioclimatic house, thanks to its intake of sunshine (see table 3), attains an indoor temperature of 18° to 20°C in 24 hours (curve A). The storage walls, situated inside behind the glass, allow, by loading and unloading heat, a stable indoor temperature over a 24-hour period.